Gold Plated Medallion with Pink and White Enamel Inlay. 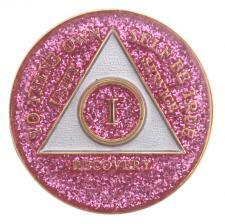 The Serenity Prayer is featured on the back of this pink AA recovery medallion. A perfect recovery gift to celebrate that AA birthday/anniversary.